from 435 USD per person based on double cabin . For your sailing trip on the Nile from Cairo via Luxor and Aswan, in individual cabins or privatized boat we offer you dahabiyas and sandals of différents sizes, from 4 days / 3 nights tailored cruises your desires to leave you with unforgettable memorie. Welcome aboard ! IMPORTANTE INFORMATION : Egyptair and many European flight compagnies offer direct flights to Cairo or Luxor. Egyptair offert direct flights from Cairo to Luxor. Check online or via your regular travel agency. NEW & EXCLUSIVE : Royal Cruise Cairo - Luxor - Aswan sailing a dahabiya or sandal 16 days sailing cruise on the Nile for your group eventually tailor made program. The DAHABIYA was the normal way to ascend the Nile .At the period of 1920 - 1940's it was communly used during those elegant days of monarchy when aristrocates, pashas, emirs, sultans and sophisticated travelers love to cruise the Nile in style and even after that they remained somewhat popular amongst the wealthy. It took from 2 to 3 months to ascend the Nile under wind power and a month and a half to float back down stream, stopping at the great temples along the way. The Dahabiya's were popular amongst those who wished to enjoy Egypt at a leisurely place, to drink on the landscape and peruse the monuments and villages on the riverbanks . Now days, we have revived those elegant days with modern comfort and conviniences. 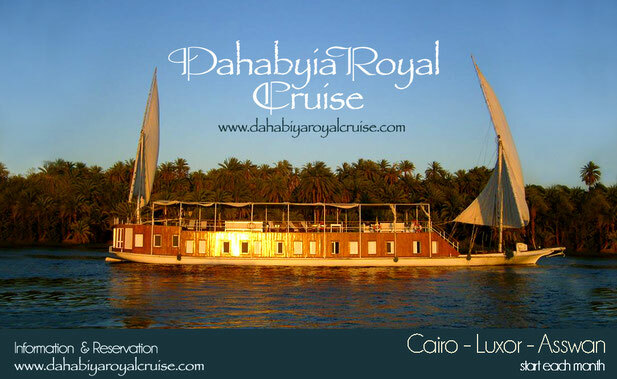 Welcome to DAHABIYA ROYAL CRUISE, your unique adventures on the Nile.